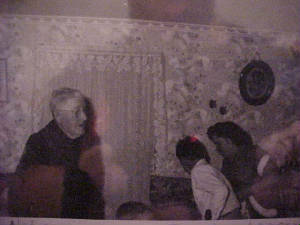 Pictured above is Grandpa Nels Mother & Step Father, Anders and Ella. The writting on the back of this photo is a little unclear, which leaves me with more questions..... It does not mention a last name for either Anders or Ella. After much research I'm almost certain the name NELSON come from Ella's previous marriage, but I still have no idea what Ander's last name was? NOTE: Nels's step father Anders last name could have been Munson. When I was a little girl I remember hearing something about Grandpa Nels & the last name Munson, but when I asked Aunt Irene if that was her dad's real name she had a cow and said somethings I can not repeat.....lol. Anyways I was never brave enough to ever bring the subject up again so until I find some records to prove this, the name Munson remains another family mystery. 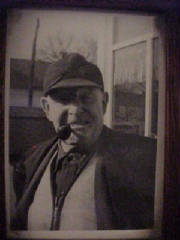 Also - I'm Still looking for answers to: How old was Gpa Nels when his biological father passed away? The obituary for him says he was the son of Andrew and Ella Nelson..... but that's it? I know nothing about Grandpa Nels biological father, but in my study of Swedish culter I would almost bet it's safe to say his name might also have been Nels. 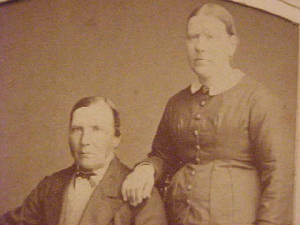 In old Swedish tradition many times son's & daughter's of the same family have different last names. A son may have a name like Nels Nelson, Carl Carlson, John Johnson, Anders Anderson, ect. The "son" added to the first given name tells who the child is the son of. So Nels Nelson tells us that Nels might be the son of Nels. In girls "dotter" is added to the first name, ex Nelsdotter, Carlsdotter ect to tell who they are the daughter of. So this makes researching a family I have very little information on extremely difficult. On top of that, I'm not sure if Anders & Ella stayed in Sweden or if they followed Grandpa Nels to America. I don't know if there were other children or if Grandpa was an only child? Anyone with additional info on these family members please contact me! THANK YOU! 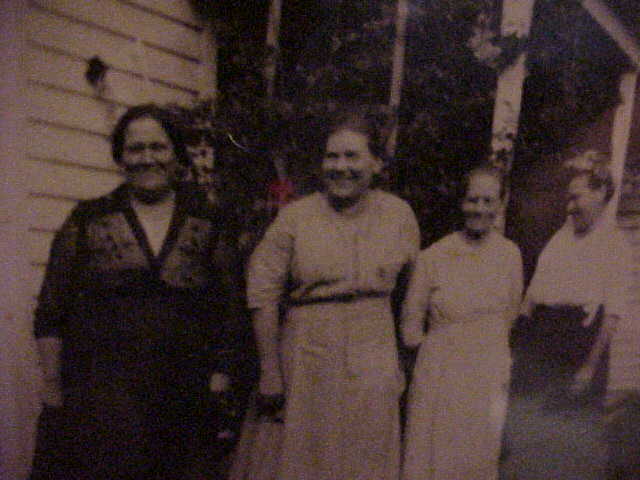 Grandma Ora is pictured above from left to right with Grandpa Nels's Cousin Molinda, Aunt Nellie & Cousin Bessie. NOTE: When I was a little girl, Irene had a suitcase with old clothes that she let us use to play dress up. The black dress Grandma Ora is wearing in this picture was one the dresses in that suit case. Not sure what ever happened to it but it would be nice to find it. Mary Ora (known as just Ora) was the youngest of ten children born to William Perry Myers, she also had a half brother & a half sister born to her mother's first marriage to Pete Mattson. Not sure if Nels had any siblings, more info I'm searching for. Ora and Nels were married on October 28, 1898 in Oquawka, Illinois. They spent their entire married life together in the New Boston & Bay Island area. Standing behind from left to right: Mary Irene, Ellis, Lester, Lloyd, Earle & Carl. NOTE: The only one's I am sure about are Irene because she's the only daughter and my grandpa Carl. Not positive of the order of the other four son's. If I'm wrong PLEASE let me know so I can make changes. NOTE: If you look real close on the original photo there are at least two people standing on the roof of the porch. I remember Irene talking about this photo. Seems she said some of the animals were rescued from roof tops as well. 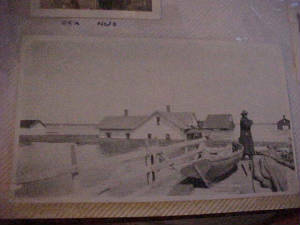 Family Lore tells that Grandpa Nels came to America from Sweden around the year 1880 when he was about 17 or 18 years old. It also says He traveled with his Uncle Pete, so I'm guessing if there was additional family for Nels, they stayed in Sweden at least for the time being and may have treveled at a later date? NOTE: When checking immigration records on ancestry.com there are OVER 90,000 records of the name Nels Nelson or Pete Nelson immigrating from Sweden! I'm also not sure if Uncle Pete was a brother to Nels father or his Mother? I'm guessing he was a brother to his father. I've located his family in the Alexis/Galesburg Area through find-a-grave and Ancestry.com. 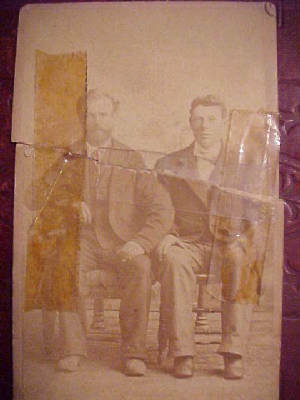 The origins of Pete Nelson and Nels Nelson’s families are very sketchy and hard to follow. Census records make things a little more confusing. According to the 1900 and 1910 Census Records, Pete Immigrated in 1869. According to the 1920 Census record for Nels, he immigrated to the US is 1880 and was Naturalized in 1885. By 1880 Pete was living in Henderson, Knox County, IL with his wife and four children, so if Nels did travel to America with his Uncle Pete, Pete would have had to returned to Sweden to bring Nels to America, which seems unlikely? Also, Pete had a Daughter Bessie, who was born in Sweden, Dec 1868, but his wife Nellie (Erickson) Nelson's records state that she immigrated in 1873 and they were married the same year. Pete's second child August Nels Nelson was born in Knox County, Illinois in May of 1874. So perhaps Nellie was Pete's second wife and his first wife, the mother of Bessie, had died in Sweden and Bessie traveled to America with Nellie? OR His 1st wife died after arriving in the US and Nellie traveled here with her own family? According to Bessie's 1910 Census Record she immigrated to America in 1874 at the age of 6. 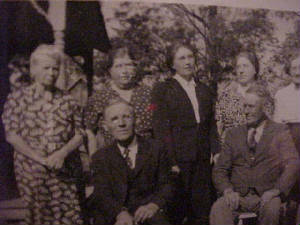 Bessie b.1868 – d.1942; born in Sweden, August Nels b.1874 – d.1966, Emma b.1876 - d.?, Molinda b.1877 - d.?, Nellie M. b.1878 - d.?, Oscar Edward b.1882 – d.1954, Ida b.1884 - d.?, Minnie b.1888 - d.? and Hattie b.1890 -d.? all born Illinois. The 1900 census states that Nellie is the mother of 10 children, 8 living, so there are two other children, names unknown at this time. Hand written at the top it just says Uncle Pete & Nels Nelson. 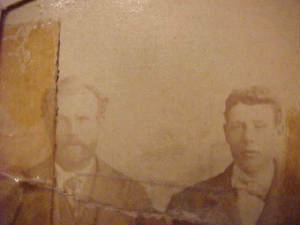 The back of this picture says: Cousins of Nels. 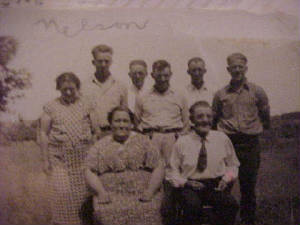 These are Aunt Nellie Nelson's children, cousins of Nels Nelson. August & Oscar - sitting in front. Bessie, Nellie, Hattie, Molinda & Minnie - standing in back. 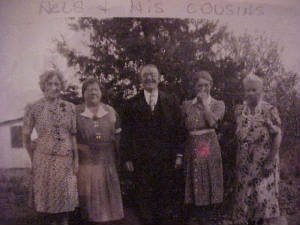 This photo of Grandpa Nels hung on Aunt Irene's wall for years. Irene was the only daughter of Mary Ora (Myers) & Nels Nelson. 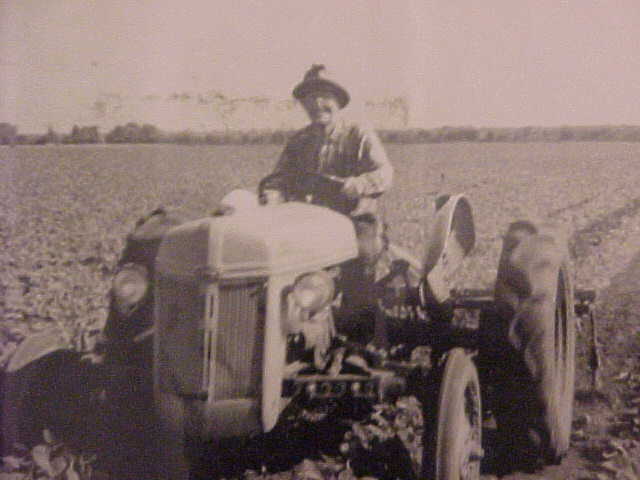 He learned to drive a tractor in "one easy lesson"
Grandpa Nels was a hard working man till the day he died. He preferred to use his horses for farming until he was forced to retire them and learn how to operate a tractor. I have two different News paper Articles (one copy & one original) telling how amazing the community thought he was too. 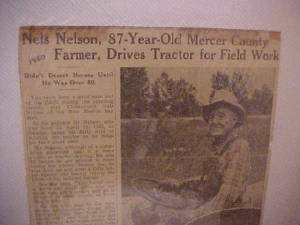 Aledo - Several older men of Mercer County have returned to active duty after retirement in the effort to keep up food production, but it is doubtful if any of the age of Nels Nelson, 82, of New Boston, can equal his record. He has been working daily and only this year learned how to operate one of the modern high speed tractors. And he did it in "one easy lesson" which, however, he does not recommend to his city cousins. Mr. Nelson resides in the Bay Island drainage district, north of New Boston. He was born in Sweden, April 11, 1863, and came to the United States when he was 19 years old. Most of the time since then he has been farming. 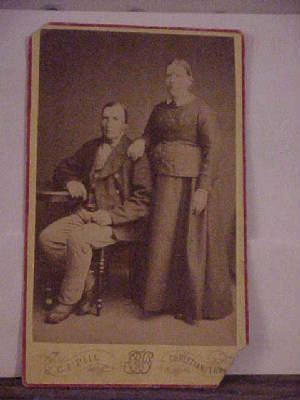 He married Miss Ora Myers of New Boston and they have resided in the Bay district since 1911. He is associated with his son Carl, in farming a large acreage on two farms. Another son, Corporal Earl Nelson, is in Germany. You can't keep a good man out of the fields during planting season, says 87 year old Nels Nelson of the New Boston bay area. So the peppery Mr. Nelson, who was born on April 11, 1863, in Sweden, takes his daily stint of running the tractor as he helps his boys plant corn. Mr. Nelson, although of a somewhat advanced age, is a mere rookie at tractor driving. He was 82 before he got around to mastering the tractor. Before that he was dead set and even a little bitter against the tractor taking the place of his beloved horses. Now he says, "You never saw a horse you could drive into the yard, turn off a switch and go to dinner." In other words, he loves that tractor. He has four sons in the New Boston neighborhood, Lloyd, Ellis, Earl and Carl. 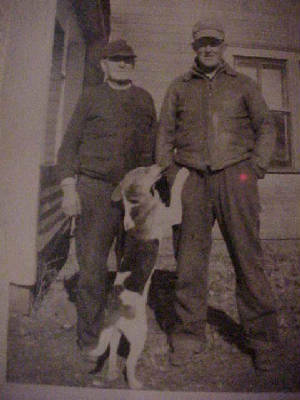 Earl lives on the home place and Carl farms 400 acres about four miles away. The two brothers trade back and forth and dad goes right along with them whenever there are chores to be done. Another son, Lester, lives in Monmouth, and a daughter, Irene, is at home. There are 18 grandchildren and four great-grandchildren. This year the boys, thinking of their father's age, decided to get a relief driver for the tractor normally driven by the old gentleman. But fur flew when he got wind of that and back to the tractor he went.